Today’s AM fix was USD 1371.00, EUR 982.30 and GBP 821.70 per ounce. Yesterday’s AM fix was USD 1355.75, EUR 977.47 and GBP 817.01 per ounce. Gold rose $20.10 or 1.5% yesterday to $1,367.10/oz. Silver surged 47 cents or 2.2% to $21.28/oz. Gold extended gains to a third session today, reaching fresh six month highs as investors hedged geopolitical risks and Chinese economic slowdown fears. Gold hit $1,375.20, its highest since September 10 and has gained 14% so far this year on global geopolitical and macroeconomic risk. A significant bond default in China and a weak exports report has sent equities and base metals lower in recent days. More data overnight showed China’s economy slowed sharply in the first two months of the year, with growth in investment, retail sales and factory output all falling to multi-year lows. The biggest factor driving gold prices at the moment is the increasing tension between the West and Russia over Ukraine. The EU agreed on a framework yesterday for its first sanctions on Russia since the Cold War. This is a much stronger response to the Ukraine crisis than many expected and a mark of solidarity with Washington. Senior American military officials have been making hawkish sounds and warned that they are ready for a military response to Russia. Russian government officials and businessmen are bracing for sanctions resembling those applied to Iran according to Bloomberg. Should Russian foreign exchange reserves and bank assets be frozen as is being suggested, then Russia would likely respond by wholesale dumping of their dollar reserves and bonds. Currency wars could soon take the turn for the worst that many of us have warned of for some years. Gold’s technical picture is increasingly positive after breaking resistance at $1,360/oz and the next levels of resistance are at $1,376/oz and $1,434/oz, the high from August 28th last year. In the short term, gold may be vulnerable to some profit taking and a period of correction and consolidation. U.S. Mint sales of Platinum Eagle bullion coins rose by 200 Tuesday after advancing 8,500 on Monday, the first day of issue since 2008. 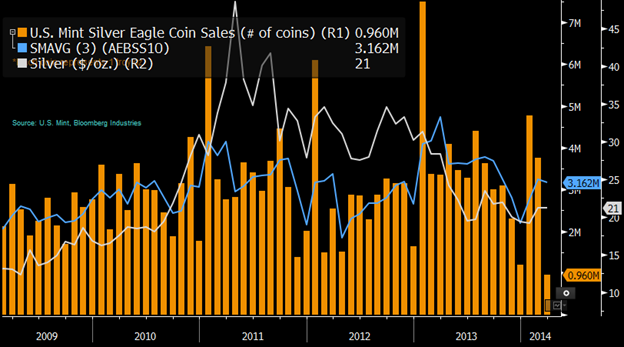 Also higher on the day were sales of Silver Eagle coins. Sales rose 388,500 to above 1.1 million for the week, surpassing last week’s total. February silver coin sales rose 11% yoy as prices fell 33% (see chart). Silver coin sales were down 22% from January. January produces sales spikes as collectors buy coins bearing the new year’s date and bullion wholesalers secure their inventories of new year coins for the year ahead. The American Eagle 1 ounce Silver bullion coin is the official U.S. national silver bullion coin, and is the world’s most widely sold 1 oz silver coin. In fact, over 335 million Silver Eagles have been sold since 1986. Download your Comprehensive Guide to the American Silver Eagle here.